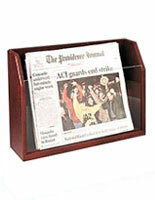 These newspaper holders, also called tabloid displays, are the perfect racks for newsstands and convenient stores. Bookstores can also take advantage of the wood, wire, and acrylic literature stands. 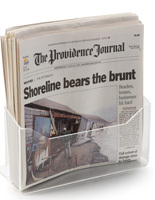 Most of the broadsheet newspaper holders are designed for countertop use, although there are some racks that mount on the wall or stand on the floor. 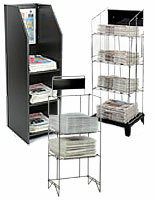 The tabloid displays make it easy for any retailer to exhibit their latest printed publications, especially periodicals. 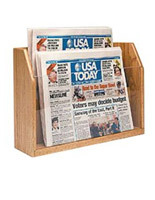 Why use newspaper holders like these stands to showcase reading materials? 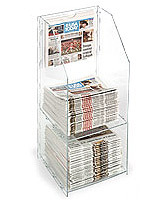 The news tabloid displays ensure high visibility so customers instantly notice the available periodicals. 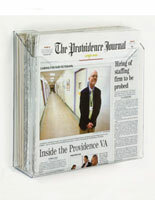 Each rack features an open design that keeps titles and front pages visible at all times. Search the wide-ranging display catalog today to find the best periodical stands for retail merchandising and other commercial tasks. What is the best placement strategy for these wholesale tabloid displays? As with any retail merchandising systems, the newspaper holders will do better in high prominence areas. Many stores position the paper racks close to an entryway or exit, so customers take notice of any available publications immediately. Some of the countertop fixtures are great for creating point-of-purchase presentations. The displays can be set on a counter at a checkout stand or service desk to encourage impulse purchases. Lots of retailers have experienced great success with this technique. What are the newsprint stands made of? 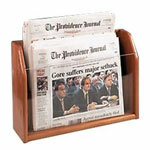 Like all of our merchandise display systems, these tabloid holders are crafted from high quality materials that last. Wooden box-style holders offer exceptional style and longevity. The rugged construction lends a very traditional look while providing a long-lasting retail display solution. Acrylic designs are quite a bit cheaper and offer businesses an affordable alternative. In addition, the clear assembly always ensures that customers are able to read the front page or title of the displayed periodical. 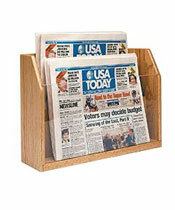 These acrylic newspaper racks come in countertop and wall mounting configurations. Our advice is to carefully consider each option depending on your specific newsprint sales application. There is certainly a model for every business. Some news media suppliers have pages upon pages of publications to display. The racks provide a centralized area for broadsheet reading materials as well as smaller gossip magazines and columns. Daily papers and other news periodicals are frequently changed out, which is why these products have to be easy to use. Even stores that give away free publications can benefit from the increased organization that these stands supply. Rather than having a messy pile no one can make sense of, the periodicals are neatly arranged for fast perusal. 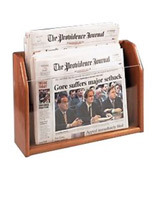 Browse the broad selection of display stands for news media publications, gossip columns, broadsheets, and other press-related reading materials now for the best in discount paper racks. Choose from our large selection of in stock & ready to ship broadsheet displays that integrate a selection of color finishes, sizes, and materials. With standing, wall mount, desktop, and portable products, retailers and businesses will have no problem marketing their periodicals. Each of these newsprint or gossip paper displays keeps literature & periodicals sorted and accessible. It is important for any retail store to buy merchandising tools that maintain the quality of printed materials. No customer wants to browse creased, wrinkled, or worn periodicals. Why not ensure a professional presentation for your printed publications by making sure they are in the best condition. 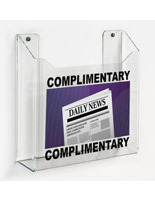 Try placing a newsprint stand in a lobby, near a trade show booth, or at a convenient store counter. Displays2Go has been manufacturing retail, marketing displays for since 1974. We are a leader in this niche industry. With the evolution of on-line stores, a lot of "virtual" display houses have introduced themselves into the POP marketplace. These virtual display houses are nothing more than mere brokers, often re-faxing your purchase order to a real display manufacturer. As a broker, they lose control over quality and service. You, as the customer, are the one that suffers when virtual display house brokers pretend to be more than what they are. It is a simple point of fact that we (Displays2Go as the manufacturer) can provide better service during the whole buying-shipping transaction. Our ever-expanding product line includes over thousands of different products ready to ship from our warehouse. As a premiere fixture manufacturer, 98% of our orders ship within 24 and orders received by 3PM EST (M-F) ship the same day. Orders can be quickly placed from our website or over the phone, our staff is waiting for your order. Also our design sales team can quote and prototype your custom point of purchase or retail merchandising display requests in hours not days.